- is the Mind itself only. only due to Divine Spirit in us. 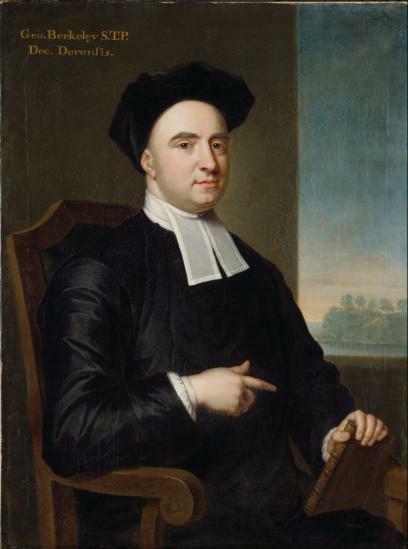 who first in Western Philosophy came so close and elaborated the concept – so familiar since very long time in Indian religious philosophy – especially in Buddhist Yogācāra school and later the teachings of Śankara – Subjective Idealism – initially called "immaterialism" – by George Berkeley himself. As we know – Subjective Idealism – is a view on reality and the theory of knowledge – which postulates – that Reality – it is something we perceive by our senses – as sensible perceptions – which forms Ideas in our Mind (or Spirit) and this Reality – is to be found in the Mind (Spirit) – which perceives it. It follows – that the Reality we perceive – is not to be found somewhere else – it is not something outside our Mind existing – it is not some unknown Substance or Matter – outside our Mind. Reality – it is our perceptions and our inference. – the conclusion follows – that there is still some Other and Absolute Mind – which produces, creates and perceives those Ideas – which afterwards are perceived by us – and which creates our daily Reality around. The Other, Absolute and Perfect Mind – creating our Reality – is the God. we will meet 2 characters of philosophical dialogue - Philonous (Greek: "lover of mind") – who represents the views of Berkeley himself – and Hylas (Greek: "matter") embodies the Irish thinker's opponents, such as John Locke. but my thoughts were so taken up with a subject I was discoursing of last night, that finding I could not sleep, I resolved to rise and take a turn in the garden. PHIL. It happened well, to let you see what innocent and agreeable pleasures you lose every morning. Can there be a pleasanter time of the day, or a more delightful season of the year? its faculties too being at this time fresh and lively, are fit for those meditations, which the solitude of a garden and tranquillity of the morning naturally dispose us to. But I am afraid I interrupt your thoughts: for you seemed very intent on something. but my request is, that you would suffer me to impart my reflexions to you. pretended either to believe nothing at all, or to believe the most extravagant things in the world. This however might be borne, if their paradoxes and scepticism did not draw after them some consequences of general disadvantage to mankind. they will be tempted to entertain suspicions concerning the most important truths, which they had hitherto held sacred and unquestionable. PHIL. I entirely agree with you, as to the ill tendency of the affected doubts of some philosophers, and fantastical conceits of others. I am even so far gone of late in this way of thinking, that I have quitted several of the sublime notions I had got in their schools for vulgar opinions. since this revolt from metaphysical notions to the plain dictates of nature and common sense, I find my understanding strangely enlightened, so that I can now easily comprehend a great many things which before were all mystery and riddle. to wit, that there is no such thing as MATERIAL SUBSTANCE in the world. but, if I were made to see anything absurd or sceptical in this, I should then have the same reason to renounce this that I imagine I have now to reject the contrary opinion. HYL. What can be more fantastical, more repugnant to Common Sense, or a more manifest piece of Scepticism, than to believe there is no such thing as MATTER? PHIL. Softly, good Hylas! What if it should prove that you, who hold there is, by virtue of that opinion, a greater sceptic, and maintain more paradoxes and repugnances to Common Sense, than I who believe no such thing? HYL. With all my heart! Since you are for raising disputes about the plainest things in nature, I am content for once to hear what you have to say. PHIL. Whether does doubting consist in embracing the affirmative or negative side of a question? PHIL. He then that denies any point, can no more be said to doubt of it, than he who affirms it with the same degree of assurance. I said indeed that a SCEPTIC was one who doubted of everything; but I should have added, or who denies the reality and truth of things. PHIL. What things? Do you mean the principles and theorems of sciences? But these you know are universal intellectual notions, and consequently independent of Matter. The denial therefore of this does not imply the denying them. HYL. I grant it. But are there no other things? What think you of distrusting the senses, of denying the real existence of sensible things, or pretending to know nothing of them. Is not this sufficient to denominate a man a SCEPTIC? HYL. Those things which are perceived by the senses. Can you imagine that I mean anything else? Are those things only perceived by the senses which are perceived immediately? Or, may those things properly be said to be SENSIBLE which are perceived mediately, or not without the intervention of others? PHIL. In reading a book, what I immediately perceive are the letters; but mediately, or by means of these, are suggested to my mind the notions of God, virtue, truth, etc. Now, that the letters are truly sensible things, or perceived by sense, there is no doubt: but I would know whether you take the things suggested by them to be so too. yet that cause cannot be said to be a sensible thing, or perceived by the sense of seeing? HYL. To prevent any more questions of this kind, I tell you once for all, that by SENSIBLE THINGS I mean those only which are perceived by sense; and that in truth the senses perceive nothing which they do not perceive IMMEDIATELY: for they make no inferences. The deducing therefore of causes or occasions from effects and appearances, which alone are perceived by sense, entirely relates to reason. sensible things are those only which are immediately perceived by sense. or by hearing, anything but sounds; by the palate, anything besides tastes; by the smell, beside odours; or by the touch, more than tangible qualities. PHIL. Does the REALITY of sensible things consist in being perceived? or, is it something distinct from their being perceived, and that bears no relation to the mind? And of these I ask, whether by their real existence you mean a subsistence exterior to the mind, and distinct from their being perceived? They are both perceived by sense; nay, the greater degree of heat is more sensibly perceived; and consequently, if there is any difference, we are more certain of its real existence than we can be of the reality of a lesser degree. HYL. None can deny it. PHIL. What shall we say then of your external object: is it a material Substance, or no? PHIL. Is not the heat immediately perceived? it follows that this same simple idea is both the intense heat immediately perceived, and the pain; and, consequently, that the intense heat immediately perceived is nothing distinct from a particular sort of pain. PHIL. Or can you frame to yourself an idea of sensible pain or pleasure in general, abstracted from every particular idea of heat, cold, tastes, smells? etc. PHIL. Does it not therefore follow, that sensible pain is nothing distinct from those sensations or ideas, in an intense degree? A very violent and painful heat cannot exist without the mind. PHIL. It has not therefore according to you, any REAL being? HYL. True: but it was because I did not then consider the ground there is for distinguishing between them, which I now plainly see. it follows that no intense heat can really exist in an unperceiving corporeal substance. But this is no reason why we should deny heat in an inferior degree to exist in such a substance. HYL. That is no difficult matter. You know the least pain cannot exist unperceived; whatever, therefore, degree of heat is a pain that exists only in the mind. But, as for all other degrees of heat, nothing obliges us to think the same of them. may we not conclude that external bodies are absolutely incapable of any degree of heat whatsoever? PHIL. If you are resolved to maintain that warmth, or a gentle degree of heat, is no pleasure, I know not how to convince you otherwise than by appealing to your own sense. But what think you of cold? for to feel a very great cold, is to perceive a great uneasiness: it cannot therefore exist without the mind; but a lesser degree of cold may, as well as a lesser degree of heat. will not the water seem cold to one hand, and warm to the other? PHIL. When a pin pricks your finger, does it not rend and divide the fibres of your flesh? PHIL. And when a coal burns your finger, does it anymore? you should not, conformably to what you have now granted, judge the sensation occasioned by the fire, or anything like it, to be in the fire. HYL. Well, since it must be so, I am content to yield this point, and acknowledge that heat and cold are only sensations existing in our minds. But there still remain qualities enough to secure the reality of external things. PHIL. Let us examine them in order. What think you of TASTES, do they exist without the mind, or no? You asked whether heat and cold, sweetness at were not particular sorts of pleasure and pain; to which simply, that they were. those qualities, as perceived by us, are pleasures or pain existing in the external objects. We must not therefore conclude absolutely, that there is no heat in the fire, or sweetness in the sugar, but only that heat or sweetness, as perceived by us, are not in the fire or sugar. PHIL. I say it is nothing to the purpose. Our discourse proceeded altogether concerning sensible things, which you defined to be, The things we immediately perceive by our senses. Whatever other qualities, therefore, you speak of as distinct from these, I know nothing of them, neither do they at all belong to the point in dispute. You may, indeed, pretend to have discovered certain qualities which you do not perceive, and assert those insensible qualities exist in fire and sugar. But what use can be made of this to your present purpose, I am at a loss to conceive. Tell me then once more, do you acknowledge that heat and cold, sweetness and bitterness (meaning those qualities which are perceived by the senses), do not exist without the mind? PHIL. But, for your farther satisfaction, take this along with you: that which at other times seems sweet, shall, to a distempered palate, appear bitter. And, nothing can be plainer than that divers persons perceive different tastes in the same food; since that which one man delights in, another abhors. And how could this be, if the taste was something really inherent in the food? And, with regard to these, I would fain know whether what has been said of tastes does not exactly agree to them? Are they not so many pleasing or displeasing sensations? PHIL. Can you then conceive it possible that they should exist in an unperceiving thing? PHIL. Or, can you imagine that filth and ordure affect those brute animals that feed on them out of choice, with the same smells which we perceive in them? PHIL. May we not therefore conclude of smells, as of the other aforementioned qualities, that they cannot exist in any but a perceiving substance or mind? PHIL. Then as to SOUNDS, what must we think of them: are they accidents really inherent in external bodies, or not? because a bell struck in the exhausted receiver of an air-pump sends forth no sound. The air, therefore, must be thought the subject of sound. PHIL. What reason is there for that, Hylas? HYL. Because, when any motion is raised in the air, we perceive a sound greater or lesser, according to the air's motion; but without some motion in the air, we never hear any sound at all. PHIL. And granting that we never hear a sound but when some motion is produced in the air, yet I do not see how you can infer from thence, that the sound itself is in the air. HYL. It is this very motion in the external air that produces in the mind the sensation of SOUND. For, striking on the drum of the ear, it causes a vibration, which by the auditory nerves being communicated to the brain, the soul is thereupon affected with the sensation called SOUND. PHIL. What! is sound then a sensation? HYL. I tell you, as perceived by us, it is a particular sensation in the mind. PHIL. And can any sensation exist without the mind? PHIL. How then can sound, being a sensation, exist in the air, if by the AIR you mean a senseless substance existing without the mind? HYL. You must distinguish, Philonous, between sound as it is perceived by us, and as it is in itself; or (which is the same thing) between the sound we immediately perceive, and that which exists without us. The former, indeed, is a particular kind of sensation, but the latter is merely a vibrative or undulatory motion the air. are you sure then that sound is really nothing but motion? PHIL. Whatever therefore agrees to real sound, may with truth be attributed to motion? PHIL. It is then good sense to speak of MOTION as of a thing that is LOUD, SWEET, ACUTE, or GRAVE. HYL. I see you are resolved not to understand me. but not to sound in the real and philosophic sense; which, as I just now told you, is nothing but a certain motion of the air? PHIL. It seems then there are two sorts of sound—the one vulgar, or that which is heard, the other philosophical and real? PHIL. And the latter consists in motion? HYL. I told you so before. PHIL. Tell me, Hylas, to which of the senses, think you, the idea of motion belongs? to the hearing? HYL. No, certainly; but to the sight and touch. PHIL. It should follow then, that, according to you, real sounds may possibly be SEEN OR FELT, but never HEARD. HYL. Look you, Philonous, you may, if you please, make a jest of my opinion, but that will not alter the truth of things. we must not therefore wonder if expressions adapted to exact philosophic notions seem uncouth and out of the way. PHIL. Is it come to that? it being a main part of our inquiry, to examine whose notions are widest of the common road, and most repugnant to the general sense of the world. But, can you think it no more than a philosophical paradox, to say that Real sounds are never heard, and that the idea of them is obtained by some other sense? And is there nothing in this contrary to nature and the truth of things? HYL. To deal ingenuously, I do not like it. And, after the concessions already made, I had as well grant that sounds too have no real being without the mind. PHIL. And I hope you will make no difficulty to acknowledge the same of COLOURS. Can anything be plainer than that we see them on the objects? PHIL. The objects you speak of are, I suppose, corporeal Substances existing without the mind? PHIL. And have true and real colours inhering in them? HYL. Each visible object has that colour which we see in it. PHIL. How! is there anything visible but what we perceive by sight? PHIL. And, do we perceive anything by sense which we do not perceive immediately? HYL. How often must I be obliged to repeat the same thing? I tell you, we do not. PHIL. Have patience, good Hylas; and tell me once more, whether there is anything immediately perceived by the senses, except sensible qualities. I know you asserted there was not; but I would now be informed, whether you still persist in the same opinion. PHIL. Pray, is your corporeal substance either a sensible quality, or made up of sensible qualities? HYL. What a question that is! who ever thought it was? but, as this point was formerly agreed between us, and is still maintained by you, it is a clear consequence, that your Corporeal Substance is nothing distinct from Sensible Qualities. HYL. You may draw as many absurd consequences as you please, and endeavour to perplex the plainest things; but you shall never persuade me out of my senses. I clearly understand my own meaning. PHIL. I wish you would make me understand it too. But, since you are unwilling to have your notion of corporeal substance examined, I shall urge that point no farther. Only be pleased to let me know, whether the same colours which we see exist in external bodies, or some other. PHIL. What! are then the beautiful red and purple we see on yonder clouds really in them? Or do you imagine they have in themselves any other form than that of a dark mist or vapour? HYL. I must own, Philonous, those colours are not really in the clouds as they seem to be at this distance. They are only apparent colours. PHIL. Apparent call you them? how shall we distinguish these apparent colours from real? HYL. Very easily: Those are to be thought apparent which, appearing only at a distance, vanish upon a nearer approach. PHIL. And those, I suppose, are to be thought real which are discovered by the most near and exact survey. PHIL. Is the nearest and exactest survey made by the help of a microscope, or by the naked eye? HYL. By a microscope, doubtless. PHIL. But a microscope often discovers colours in an object different from those perceived by the unassisted sight. And, in case we had microscopes magnifying to any assigned degree, it is certain that no object whatsoever, viewed through them, would appear in the same colour which it exhibits to the naked eye. HYL. And what will you conclude from all this? You cannot argue that there are really and naturally no colours on objects: because by artificial managements they may be altered, or made to vanish. PHIL. I think it may evidently be concluded from your own concessions, that all the colours we see with our naked eyes are only apparent as those on the clouds, since they vanish upon a more close and accurate inspection which is afforded us by a microscope. I ask you whether the real and natural state of an object is better discovered by a very sharp and piercing sight, or by one which is less sharp? HYL. By the former without doubt. PHIL. Is it not plain from Dioptric that microscopes make the sight more penetrating, and represent objects as they would appear to the eye in case it were naturally endowed with a most exquisite sharpness? PHIL. Consequently the microscopical representation is to be thought that which best sets forth the real nature of the thing, or what it is in itself. The colours, therefore, by it perceived are more genuine and real than those perceived otherwise. HYL. I confess there is something in what you say. PHIL. Besides, it is not only possible but manifest, that there actually are animals whose eyes are by nature framed to perceive those things which by reason of their minuteness escape our sight. What think you of those inconceivably small animals perceived by glasses? Must we suppose they are all stark blind? Or, in case they see, can it be imagined their sight has not the same use in preserving their bodies from injuries, which appears in that of all other animals? And if it has, is it not evident they must see particles less than their own bodies; which will present them with a far different view in each object from that which strikes our senses? Even our own eyes do not always represent objects to us after the same manner. In the jaundice everyone knows that all things seem yellow. Is it not therefore highly probable those animals in whose eyes we discern a very different texture from that of ours, and whose bodies abound with different humours, do not see the same colours in every object that we do? From all which, should it not seem to follow that all colours are equally apparent, and that none of those which we perceive are really inherent in any outward object? but, is it not evident from what has been said that, upon the use of microscopes, upon a change happening in the burnouts of the eye, or a variation of distance, without any manner of real alteration in the thing itself, the colours of any object are either changed, or totally disappear? Nay, all other circumstances remaining the same, change but the situation of some objects, and they shall present different colours to the eye. The same thing happens upon viewing an object in various degrees of light. And what is more known than that the same bodies appear differently coloured by candle-light from what they do in the open day? Add to these the experiment of a prism which, separating the heterogeneous rays of light, alters the colour of any object, and will cause the whitest to appear of a deep blue or red to the naked eye. and, if you think it has, I would fain know farther from you, what certain distance and position of the object, what peculiar texture and formation of the eye, what degree or kind of light is necessary for ascertaining that true colour, and distinguishing it from apparent ones. HYL. I own myself entirely satisfied, that they are all equally apparent, and that there is no such thing as colour really inhering in external bodies, but that it is altogether in the light. And what confirms me in this opinion is, that in proportion to the light colours are still more or less vivid; and if there be no light, then are there no colours perceived. Besides, allowing there are colours on external objects, yet, how is it possible for us to perceive them? For no external body affects the mind, unless it acts first on our organs of sense. But the only action of bodies is motion; and motion cannot be communicated otherwise than by impulse. A distant object therefore cannot act on the eye; nor consequently make itself or its properties perceivable to the soul. Whence it plainly follows that it is immediately some contiguous substance, which, operating on the eye, occasions a perception of colours: and such is light. PHIL. How is light then a substance? communicate different motions to the optic nerves; which, being propagated to the brain, cause therein various impressions; and these are attended with the sensations of red, blue, yellow, etc. PHIL. It seems then the light does no more than shake the optic nerves. PHIL. And consequent to each particular motion of the nerves, the mind is affected with a sensation, which is some particular colour. PHIL. And these sensations have no existence without the mind. PHIL. How then do you affirm that colours are in the light; since by Light you understand a corporeal substance external to the mind? HYL. Light and colours, as immediately perceived by us, I grant cannot exist without the mind. But in themselves they are only the motions and configurations of certain insensible particles of matter. PHIL. Colours then, in the vulgar sense, or taken for the immediate objects of sight, cannot agree to any but a perceiving substance. HYL. That is what I say. PHIL. Well then, since you give up the point as to those sensible qualities which are alone thought colours by all mankind beside, you may hold what you please with regard to those invisible ones of the philosophers. —The red and blue which we see are not real colours, but certain unknown motions and figures which no man ever did or can see are truly so. Are not these shocking notions, and are not they subject to as many ridiculous inferences, as those you were obliged to renounce before in the case of sounds? HYL. I frankly own, Philonous, that it is in vain to longer. Colours, sounds, tastes, in a word all those termed Secondary Qualities, have certainly no existence without the mind. But by this acknowledgment I must not be supposed to derogate, the reality of Matter, or external objects; seeing it is no more than several philosophers maintain, who nevertheless are the farthest imaginable from denying Matter. The former are Extension, Figure, Solidity, Gravity, Motion, and Rest; and these they hold exist really in bodies. The latter are those above enumerated; or, briefly, All sensible qualities beside the primary; which they assert are only so many sensations or ideas existing nowhere but in the mind. But all this, I doubt not, you are apprised of. For my part, I have been a long time sensible there was such an opinion current among philosophers, but was never thoroughly convinced of its truth until now. PHIL. You are still then of opinion that EXTENSION and FIGURES are inherent in external unthinking substances? PHIL. But what if the same arguments which are brought against Secondary Qualities will hold good against these also? HYL. Why then I shall be obliged to think, they too exist only in the mind. PHIL. Is it your opinion the very figure and extension which you perceive by sense exist in the outward object or material substance? PHIL. Have all other animals as good grounds to think the same of the figure and extension which they see and feel? HYL. Without doubt, if they have any thought at all. PHIL. Answer me, Hylas. Think you the senses were bestowed upon all animals for their preservation and well-being in life? or were they given to men alone for this end? HYL. I make no question but they have the same use in all other animals. PHIL. If so, is it not necessary they should be enabled by them to perceive their own limbs, and those bodies which are capable of harming them? PHIL. A mite therefore must be supposed to see his own foot, and things equal or even less than it, as bodies of some considerable dimension; though at the same time they appear to you scarce discernible, or at best as so many visible points? HYL. I cannot deny it. PHIL. And to creatures less than the mite they will seem yet larger? PHIL. Insomuch that what you can hardly discern will to another extremely minute animal appear as some huge mountain? HYL. All this I grant. PHIL. Can one and the same thing be at the same time in itself of different dimensions? HYL. That were absurd to imagine. that is to say, by your own principles you are led into an absurdity. HYL. There seems to be some difficulty in the point.